To prepare your own food is a rare opportunity these days reserved to the few that can manage to squeeze time for this in their tightly overloaded schedule and to save energy as well while dealing with a never-ending flux of exhausting choruses. 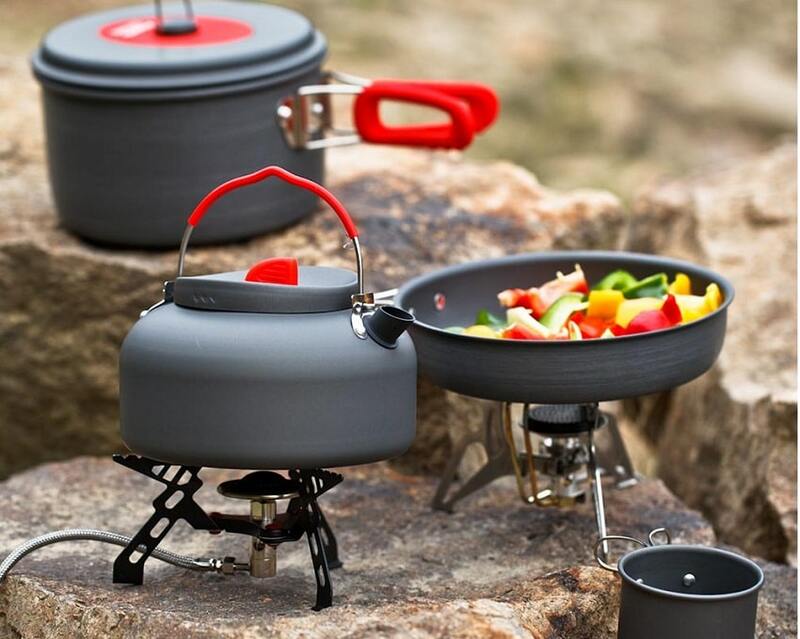 To prepare your own food in the wilderness is a must-have experience in itself. While dining outdoors can bring the common home or even restaurant supper to a whole new dimension, enhancing all your senses – cooking for yourself using almost the means of a tribal man is a unique ritual. One that connects you with your food most profoundly as you have to participate every step of the way, from putting the fire till serving the dishes. Preparing your food becomes a most captivating and rewarding activity, to such an extent that simply baking potatoes on the hot coals is enough to fill your soul and your stomach. Nonetheless, you would miss out on some fun if you go camping with only a few potatoes in your pockets, not knowing the best camping recipes. Cooking outdoors is nothing like your ordinary kitchen routine. You usually don’t have any moments of break to take a short walk or engage in a 10-minute meditation, because such an activity reclaims your constant participation. Essentially because you are employing an open fire that needs to be fed. And this fire is alive, exposed to the blows of the wind, depending on how dry or wet is the wood that it burns. If you’ve only gathered putrefied branches, your fire will simmer and your food will take an eternity to prepare. So you should be careful what you pick up from the ground before you start chopping. Moreover, it can always take you by surprise with a sudden flame that makes your cooking pot to boil over. This wildfire has its own little hooks that shift your attention back to your activity. The fire is also the one coordinate that makes the same recipe taste different every time. It’s one quirk that will make you wonder what’s the extra ingredient this time. The way it burns, either slowly or blazing – any chef or housewife knows that the boiling/frying temperature keeps the vegetables crisp or turns them creamy, helps them grow a crust or makes them stick together in a mesh. 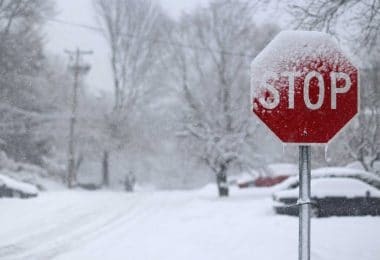 Your means to control its intensity are more or less at nature’s will, therefore it will always depend on the particular fleeting circumstances of each occasion. Not to mention that this kind of proximity to wildlife opens your imagination and creativity, you find yourself as exposed to exterior influences as much as the fire itself is, so you should not feel surprised when you’ll start adding extra ingredients. Mainly because you can’t take your entire kitchen, neither the whole supermarket with you into the woods. You need to know how you can manage to cook with the most primeval methods, what you need in order to replace the stoves, blenders, and other technological devices. Of course, you can rely on what nature itself can provide you with but when you’ll realize that you didn’t even take some salt with you, you will be so pissed-off to actually go back to the stone age. 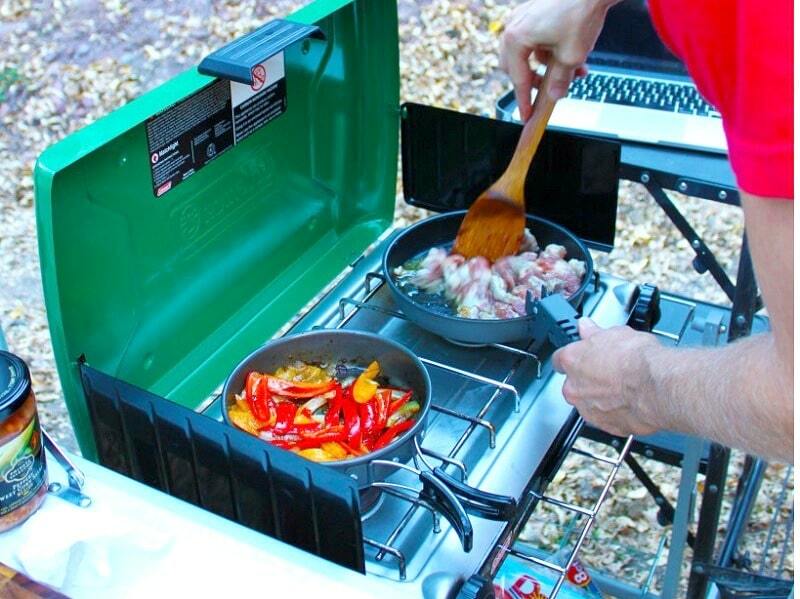 All food tastes better when cooked outdoors, either camping or a one-time barbecue. It’s the air, the natural stimuli, your engagement, your increased appetite. It’s the incredible unmistakable smoky flavor of every dish, that the food industry is trying to unsuccessfully replicate in sauces and chips. But there are certain recipes that if not cooked outdoors on an open fire, lose almost all their charms. 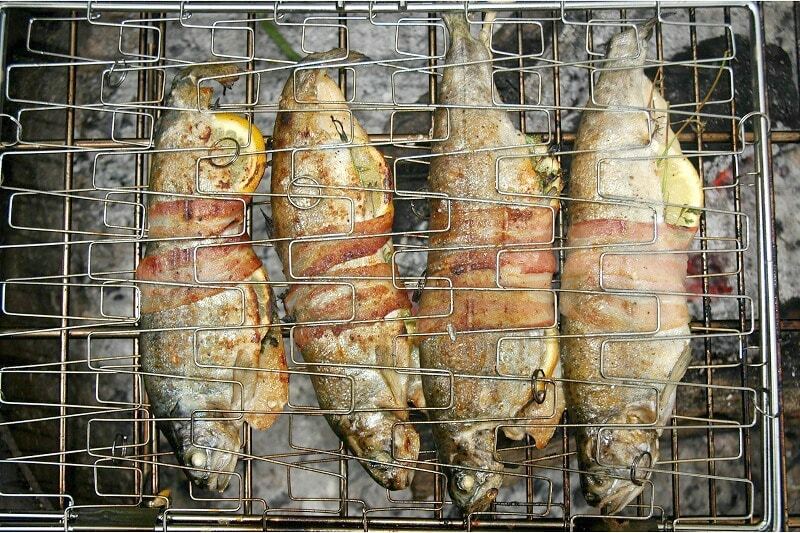 Besides, you really can’t say that you’ve gone camping if you didn’t at least bake some stuffed potatoes if not grilles the freshly fished fish. Why bring any food? Of course this a stupid question. 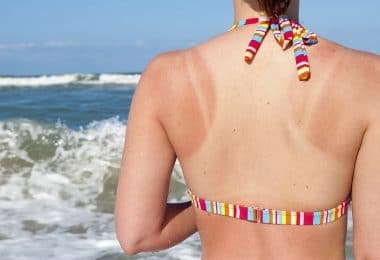 But it does point out the necessity of the minimum of preparation – when you don’t bring any pot you’ll have to bake or fry everything in order to cook it, but if you don’t bring any salt you’ll hardly even taste the food. The most special feature of this activity is that it is a mandatory one. You just can’t avoid it, since you don’t have any burger or pizza takeaway around the corner. Meanwhile, the intense physical activity consumes your body’s resources thus you need to supply your organism with what it needs. Carnivore people never stop telling the myth that without meat your body grows weak and cannot perform the easiest tasks that require minimum physical effort. Of course this is an exaggeration, nevertheless, a diet high in proteins is recommended when you spend days in a row walking, hiking and pushing your body’s regular parameters. In addition, fresh fruits and vegetables will keep your body as well as your mind fresh and a snack from time to time will provide you with enough energy to continue the trip till the cooking time comes. 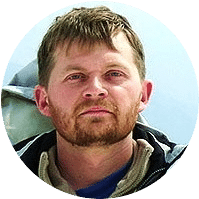 It will also make you stop regularly to take a short a break, which is one of the first rules a scout learns before launching into his first expedition. Most probably you’ve passed the age of boy scouting with the rest of the crew, marching in pairs and flaunting your little flags, so your own awareness should be enough to prompt that you are on your own. What you have and what you can collect is what you’re going to eat. If there’s no food, then there’s no stamina. It’s really remarkable because it gives you the rare opportunity to feel completely autonomous for a short period of time – it’s a privilege that comes with responsibility as well as with a most liberating feeling. The tendency is to always over-pack, that’s why you should mindfully choose your recipes to prepare yourself with everything you need and also leave behind any excess. 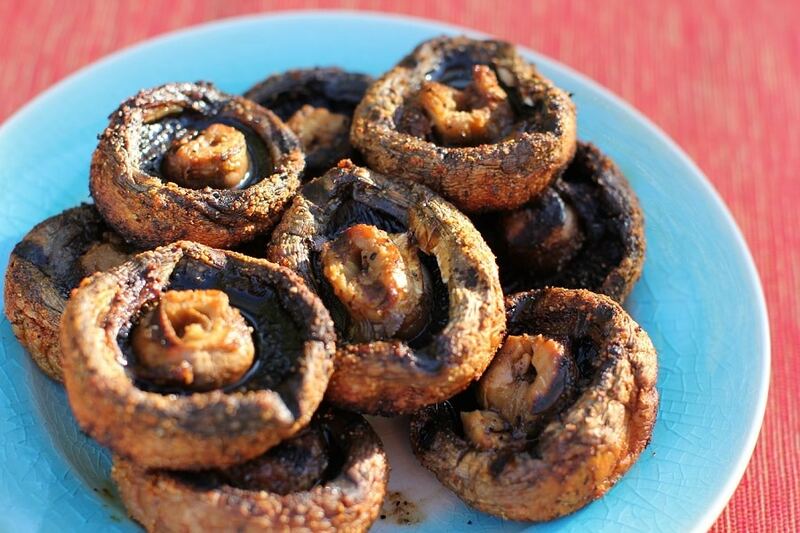 Good news is that you can use the same ingredients to prepare different dishes and you can also check out the weather, maybe it just rained the day before and the first rays of sunshine can bring you a nice mushroom harvest. Or maybe it’s the perfect moment of the season to catch some fish in the river. 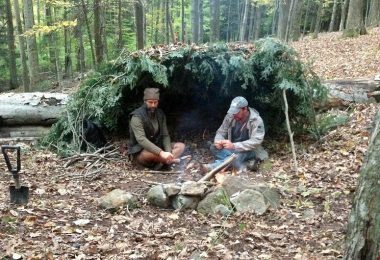 I will provide you with a list of best camping recipes, some of which are symbolic for camping life, others are pure extravaganzas, all are mainly selected for their nutritional values, keeping in mind the minimalist standard of cooking required when outdoors and encouraging you to open your eyes when walking through the wilderness and paying attention to the possibilities that arise along your way. The ones who are saying that you can’t make cream soup without the mixer, are just fools who grew this gadget extension to their arms only to diminish their creativity. Vegetables when boiled for longer, become mushy enough to be smashed with some simple utensil and mixed with the wooden spoon. Lentils can be left to soak in a little bit of water for the night or for half a day, this will make them boil faster. 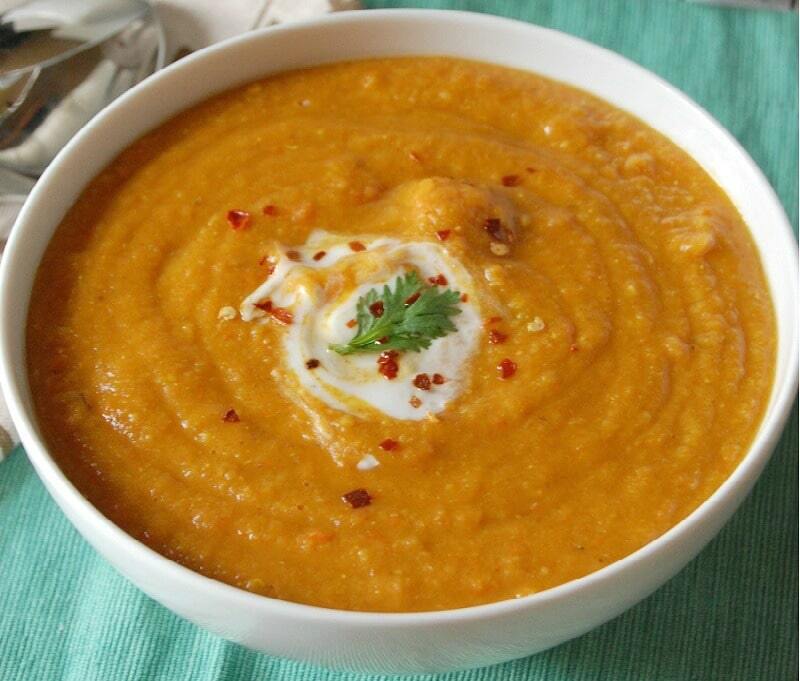 Also be careful to choose red lentils, because the other varieties take much longer to be prepared. Lentils, like all its other relatives from the legumes family, the great variety of beans and peas, are very high in proteins. Lentils itself has more proteins than the same quantity in meat. Soup is an appropriate choice for a dinner after an exhausting day. It’s much easier to process for your stomach as it’s already smashed and liquid and still consistent and nutritional enough to recharge what your body has consumed during the day. And if you have some left-over soup, it will be great to replace your snacks with soup sips the following day. Main ingredients: lentils, carrots and onions. If you fantasize to add some other like tomatoes, capsicum or peppers, feel free. But for the sake of a light backpack we’ll stick to these. You can also look for some wild thyme, it grows almost everywhere and it can add a wonderful flavor to your soup. Putt the pre-soaked lentils and the vegetables to boil in a pot with the cover on. Add water but only to cover them – about half of the quantity you want your soup to be. Add salt. You can put on a big fire, you want them to boil fast, just pay attention not to over boil. Check repeatedly to see if the water hasn’t evaporated and, if it’s necessary, add some more to bring it back to the initial level – this is essential, otherwise it will stick to the bottom of your pot. Check them from time to time by sticking a fork in them. When they crumble under the fork, they’re ready. This is a good tip that you can use for other cream soups as well: we are pre-boiling them in a smaller quantity of water as this will help them boil a lot faster and it will be much easier to smash them. Add the rest of the water and put the pot back on the fire mixing it to make it homogenous and letting it boil for another while. After a few good boils, when it’s almost done, add the thyme, take it off the fire, let it rest for about 10 minutes and enjoy it. This is one of the trademarks of the camp fire. When you put a fire you must have a potato to throw it in just for the sake of it. It’s so simple and tasty that you may end up cooking it over and over again. You need the potatoes, onions, bacon and if you add some sour cream at the end it will be delicious. You can collect some wild sage, it’ll mix excellently with everything else. Also, you’ll need aluminum foil to wrap them up. 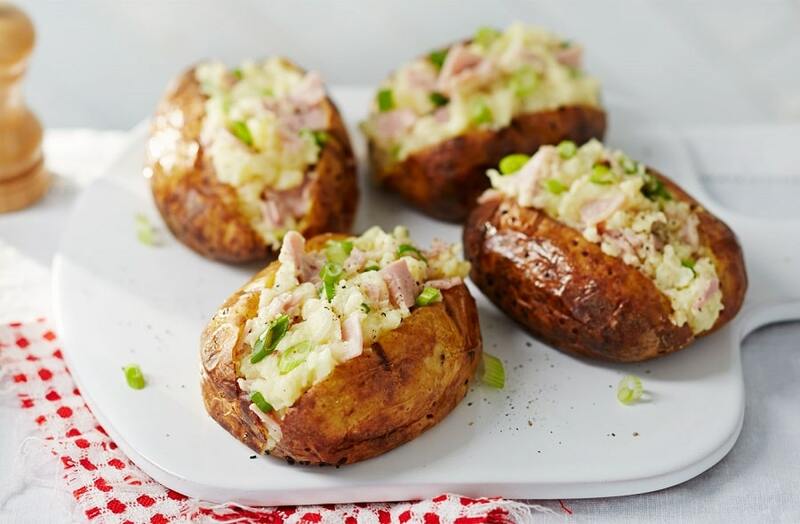 Cut the potatoes in half and stuff the chopped onions and bacon inside. Wrap them in aluminum foil and put them on the red coals. Be sure to turn them from time to time. You can also check them with a fork. When they’re done, take them off the fire, add the cream and be careful not burn your mouth, better wait a minute or two. 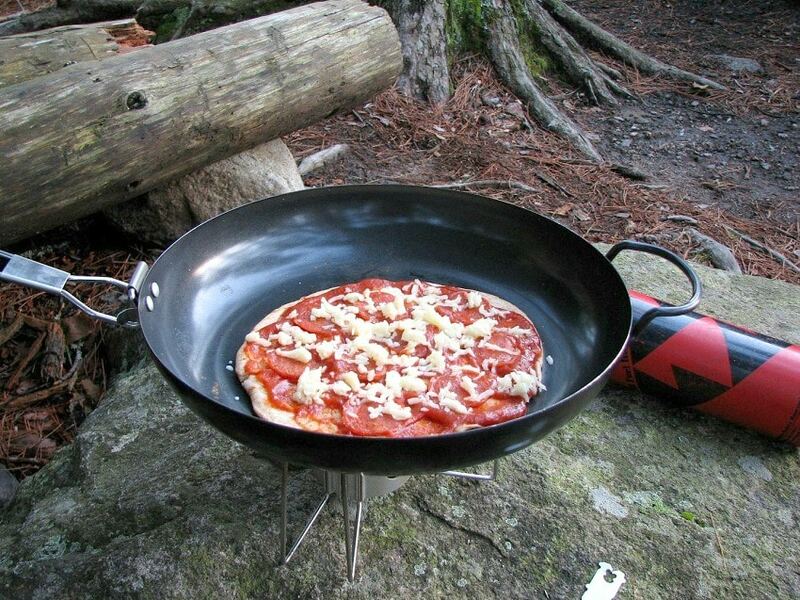 Who says you can’t eat pizza in the wilderness? An Italian would make pizza under any circumstances. So should a camper know how to prepare it himself when miles away from any Italian restaurant? The trick is that you will be using a frying pan instead of an oven, but you will manage to obtain almost the same results. To make the dough you should only supply yourself with flour, baking powder, salt, water and oil. For topping just add your favorite vegetables, mushrooms, bacon or whatever you feel like. Just don’t forget the tomato sauce and the mozzarella unless you want to reinvent pizza. For spices you can use either basil or wild oregano. Mix the ingredients for the dough and after battering it, let it rest for 5-10 minutes. Then spread it in the pan and add the topping. You can also bend one half over the other and make a type of calzone – this will help it bake easier because you can turn it on both sides to cook evenly. 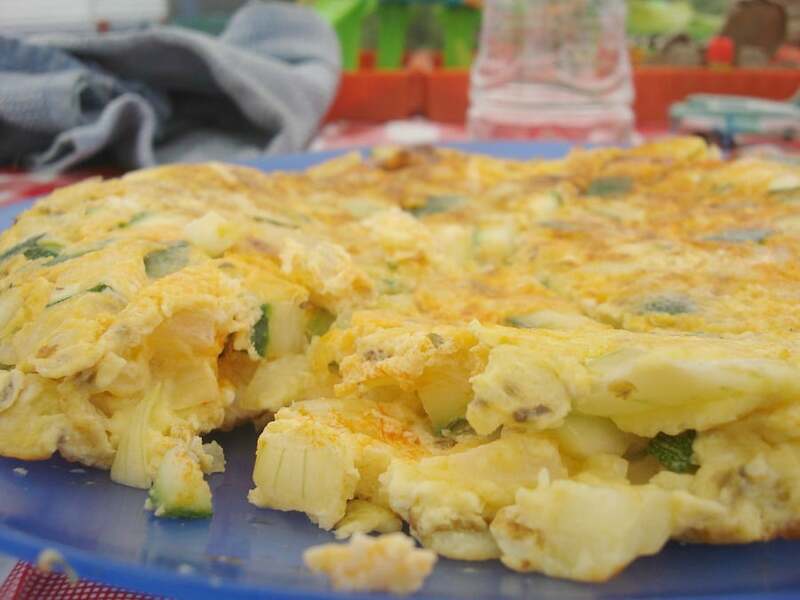 This dish resembles the well-known tortilla, though it’s transformed to suit the camping context. It’s very nutritious as well as delicious. And the catch is that you can use nettles that you can collect on your way, instead of spinach and still feel like Popeye after eating it. Ingredients: eggs, potatoes, spinach or nettles, onions, oil, salt and pepper. Put the spinach or the nettles to boil in a little bit of water. When it’s done, drain it well. Chop the onions and cut the potatoes in small pieces. Put them to fry on the fire. In the meantime mix the eggs with salt and pepper in a bowl. When the potatoes are ready, add the drained spinach and pour the eggs. It should turn into one compact mass that you can flip from one side to the other to bake it perfectly. Yes, for this you have to fish. 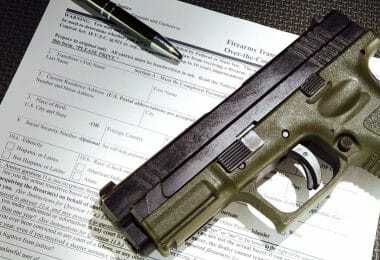 Otherwise, it’s pretty risky to pack it from home, because if not frozen, it degrades pretty quickly. And you can’t even start to compare the differences between a freshly caught fish and an old frozen one. Not to mention the satisfaction you’ll have to procure your own meal. You need the fish, onions, carrots, tomatoes. Optionally you can take a lemon with you, but most surely you can find some lemon balm to supply the subtle flavor you’re looking for, or some wild oregano to spice it up. Clean the fish, slice it in two and take out all its organs. Stuff the chopped vegetables and spices. Wrap it in aluminum foil and put it on the grill or directly on the coals. Turn it repeatedly to be sure it’s getting cooked uniformly on both sides. Maybe you’ve brought with you a bottle of wine especially for this dish, otherwise you can make a tea from the same spices you used for the fish, lemon balm and wild oregano. Of course, you shouldn’t even think of collecting wild mushrooms if you’re completely unfamiliar with them. But you can start learning. Two of the most outspread mushroom species are the common champignons, Agaricus bisporus and the parasol mushrooms, Macrolepiota procera. Both are easy to recognize and you can find them virtually everywhere in the wilderness if the conditions are optimum. Moreover, the ones that are growing wild are much more tasty than their cultivated counterparts and even bigger. Put them on the grill with their caps upwards, add a slice of mozzarella on each and also a slice of tomato. You can sprinkle some basil too for a complete treat. Let them bake under the melting cheese. You can bring frozen berries with you, but I am suggesting this recipe more because you can find and use wild berries in your walks – raspberries, blackberries, elderberries, cranberries, mulberries and even wild strawberries. It’s such a wide variety growing around in forests that you only have to open your eyes or follow a bear. If you also happen to come across some nuts or hazelnuts, your cake would upgrade to the next level. 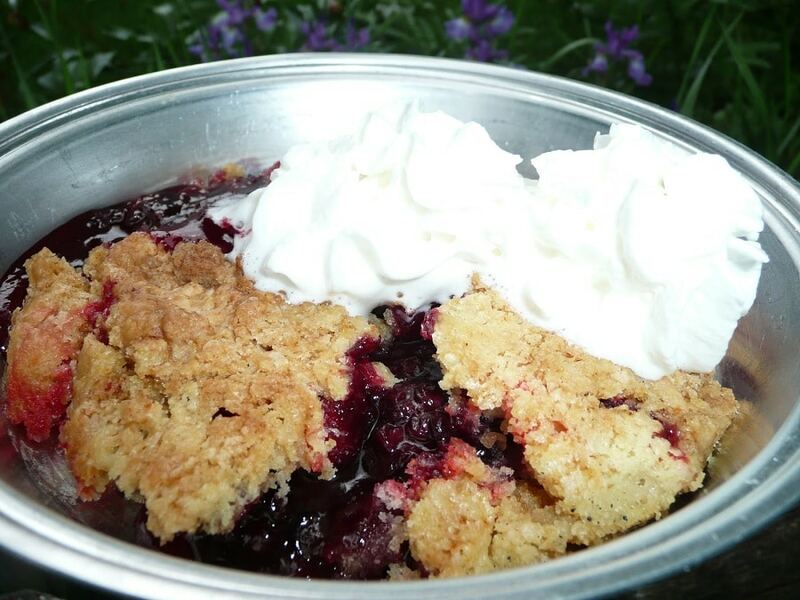 Ingredients: flour, baking powder, sugar or honey (even better), a few spoons of oil and the berries. When baking a cake in your kitchen you probably add an egg and some butter also, but don’t worry your dough will be just as tasty with only these essentials. 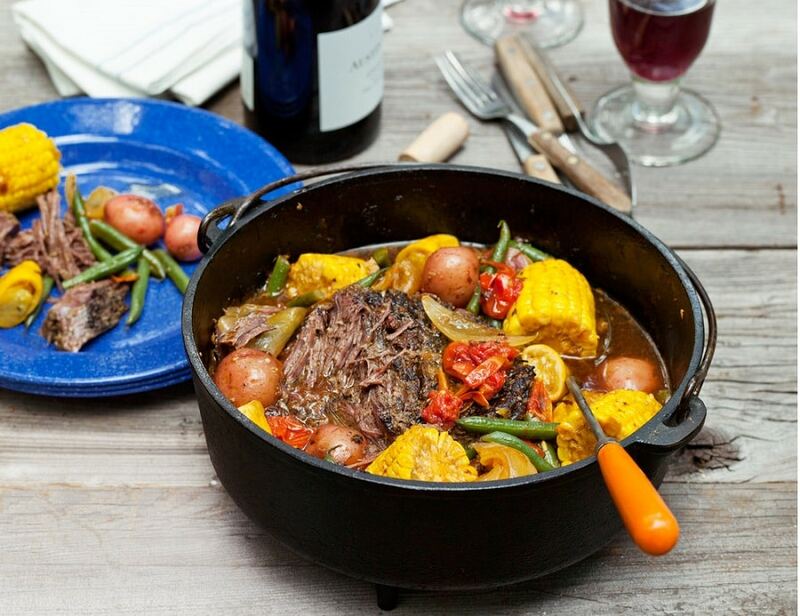 For this dish, you will probably need a Dutch stove or some similar type of pot with thick walls. You can hang it over the fire and make sure to keep it low not to burn the bottom. Or you can put in on the coals. Mix the flour, the baking powder, a drop of salt, the sugar and the oil. If you have coconut oil it would be excellent, otherwise, you can do just fine with some olive oil. Add water but be careful not to make it too liquid, the dough should be compact. Let it breathe for about 5-10 minutes. Put one thick layer of dough into the pot. Add another one of berries and nuts if you found any. And in the end, the final thin layer of dough that will transform into a crunchy tasty crust. For an extra special effect, you can sprinkle some sugar and cinnamon on top. Put it on the fire or on coals. To check it, just insert a thin stick or a stalk in its middle and see if the dough holds to the stick when you take it out, if so you need to let it bake some more. You can serve it with a flush of cream and top it with a few leaves of mint. The downside of over-preparing is that you put so much energy into choosing the most appealing recipes, collecting all ingredients, packing too many pots and utensils just to comply with your cooking requirements, that your trip through the wilderness may become a tiresome race to cook all you’ve set out to cook and use all that you’ve bought for it. 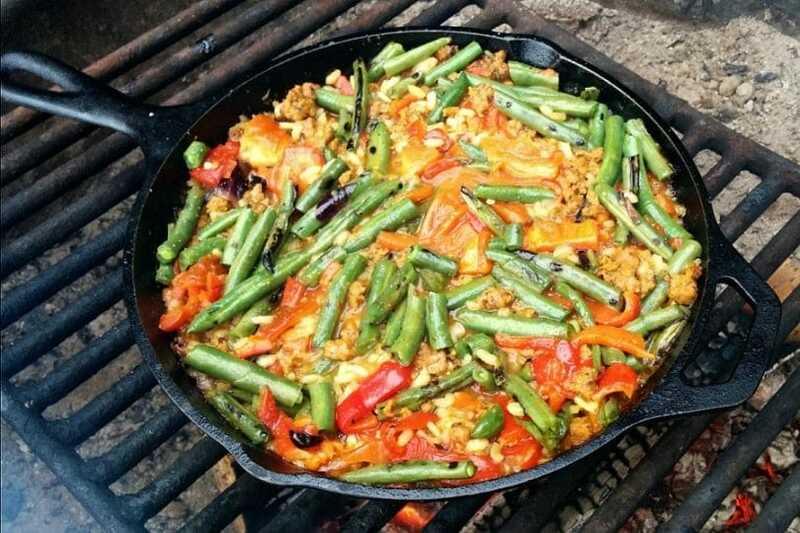 However, if you prefer to pre-packaged food that you can eat to lessen cooking, check out our review of the best backpacking meals to give you more options. Forget about wild life, fresh air, singing birds, sweet flowers perfume, shining stars and just cook. When the whole point of cooking is simply to keep you fed and fit in order to enjoy the rest. Not to mention that the best cooking recipes are the ones you discover yourself in the last days camping when you’ll be left with only a few ingredients that you’ll have to improvise with. That is the perfect circumstance for the best culinary surprises. And these surprise recipes are the one we’d be delighted to hear about. 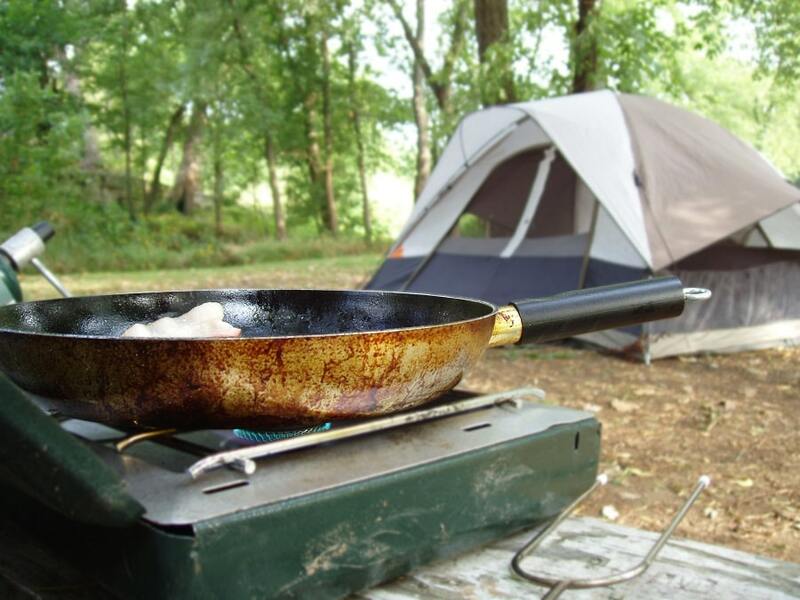 Do check out more camping food ideas by reading our earlier article on this delicious topic.